Use pulsing action to process butter, cream cheese product and flour in food processor until mixture is well blended and forms ball. Divide dough in half; shape each into ball. Wrap tightly in plastic wrap. Refrigerate 1 hour. Heat oven to 375ºF. Toss berries with granulated sugar, lemon zest and corn starch. Roll out 1 ball of dough on lightly floured surface into 14x7-inch rectangle. Cut lengthwise in half, then cut each strip crosswise in half. Repeat with remaining dough. Beat egg and water until blended. Spoon 1/4 cup berry mixture onto one end of each dough strip. Brush edges with egg; fold in half. Seal edges with fork; place on parchment-covered baking sheets. Cut small slits in tops to allow steam to escape; brush with any remaining egg. Sprinkle with turbinado style sugar. Bake 35 to 40 min. or until juices are bubbly and pastries are golden brown. With their built-in portion control, these individual pies make the perfect treats for young and old alike. Substitute 2 cups blueberries for the mixed berries. 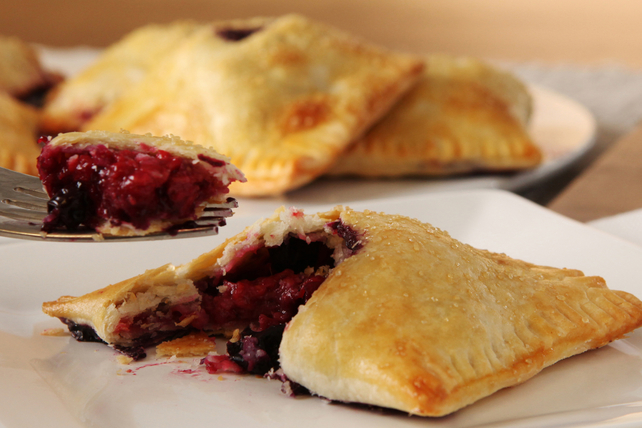 Serve these flakey hand pies warm topped with thawed Cool Whip Whipped Topping. These delicious pies are equally delicious whether served warm or cooled to room temperature.